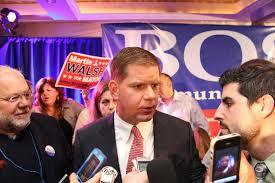 Yesterday at about 10 pm the result was in : Marty Walsh is the new Mayor of Boston. And so the long campaign ended. 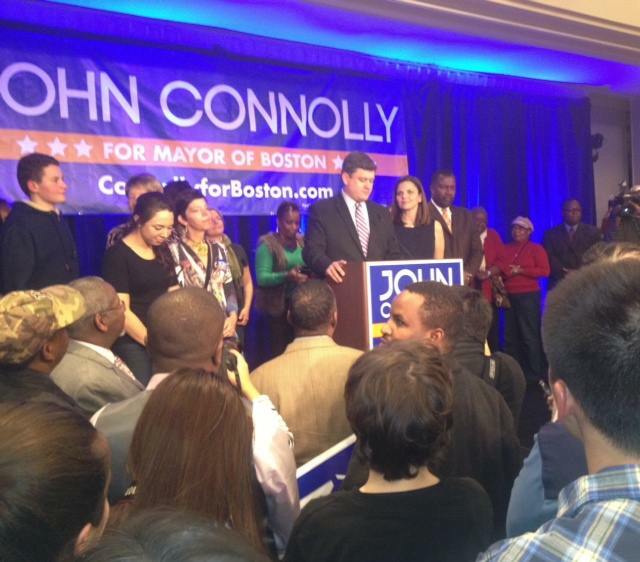 Unofficial City results give Walsh 72,514 votes to John Connolly’s 67,606. The margin of victory for Walsh was 3.49 % : a small margin but a telling one. John Connolly won only the following : the reform-minded “new Boston” Wards — 3, 4, 5, 9, and 21 plus Fort Hill (Ward 11, Precinct 1) and the Seaport Precinct in Ward 6 ; his home Wards 19 and 20; and his special, personal bastion in Charlestown (Ward 2). The City map of results suggests that he also won Ward 22. Everywhere else it was Walsh’s day. Walsh won large in South Boston and huge in Dorchester, took about a 15 to 20 point majority in Wards 12 and 14, carried Wards 8, 10 and 11, held Connolly’s margin down in some parts of Roslindale west of Washington Street; and then defeated Connolly in the decisive Wards : very narrowly in East Boston (Ward 1 — by 3803 to Connolly’s 3739) and strongly in Hyde Park-Mattapan (ward 18). Walsh did especially well in the Readville part of ward 18, where Tom Menino lives but also Angelo Scaccia, the long-time State representative whose endorsement of Walsh may well have proved the most significant of all. Next most significant was surely the quiet blessing given to Walsh by Speaker of the House Robert DeLeo, who won twice yesterday : he helped Walsh carry Ward 1 (albeit narrowly) and he now gets Walsh out of the House, where he has been a thorn in the side of the last two speakers. This result is no surprise. it has been in the cards for three weeks at least. 4.endorsements by three of the Primary season’s major mayoral candidates — all of them of color, and thus significant to the City’s voters of color; but also all of them tremendously beholden to labor unions, SEIU 1199 especially. Charlotte Golar-Richie, Felix G. Arroyo, and John Fl. Barros together gave the Walsh campaign an air of racial inclusiveness. Who will ever forget that iconic picture of them and Walsh walking together up a Dorchester street ? 10.his own, low key personality and confidence in his authenticity, which stands out maybe best when he doesn’t have a ready answer for a question — moments that happened a lot in his campaign. 11.the campaign’s 40 position papers, written with contributions from (says the Walsh campaign) 600 people, who thus became invested in their success and so part of Walsh’s GOTV army. These position papers, unleashed in the last two weeks, made Walsh look authentically Mayoral. Against this vast array of established support, John Connolly could muster only (1) a citizen reform movement, one that had barely existed until his campaign coalesced it (2) his two personal neighborhood bases, West Roxbury-Roslindale and Charlestown (3) demonstrable mastery of the City budget and (4) his opponent’s binding arbitration bill, which almost derailed the Walsh campaign and gave Connolly a major issue. Connolly also raised big money. He actually raised a bit more than Walsh did, though less in the campaign’s “crunch time.” He obviously looked a winner to many. The newness of the citizen reform movement begun by Connolly’s campaign, its vulnerablity to entrenched push back, its untested status, and Connolly’s own air of high-mindedness — so long unheard in Boston’s municipal politics that many voters, likely, did not know what to make of it — all put Connolly on the shade side of the election sundial as soon as the Primary was over and voters started to look closely at what was what. Frankly, that Connolly came so close to actually winning yesterday sends a strong message, i think, to Marty Walsh that he has a lot to prove; and to entrenched Boston power that while its strength remains barely good enough to win, its days are almost surely numbered as we move forward into the new era of non-union work ; of nightlife and nerdy ways ; of schools that either do their best or see themselves lose all public conscience (and rightly so); and of small innovative units collaborating competitively via conferencing and social media — as un-institutional a life as one can possibly imagine. The break-up of entrenched power is coming. The power knows it. This time, it has held on — just barely. Next time, the liberation.